We are so excited to share this fun project with all of you for the holidays! 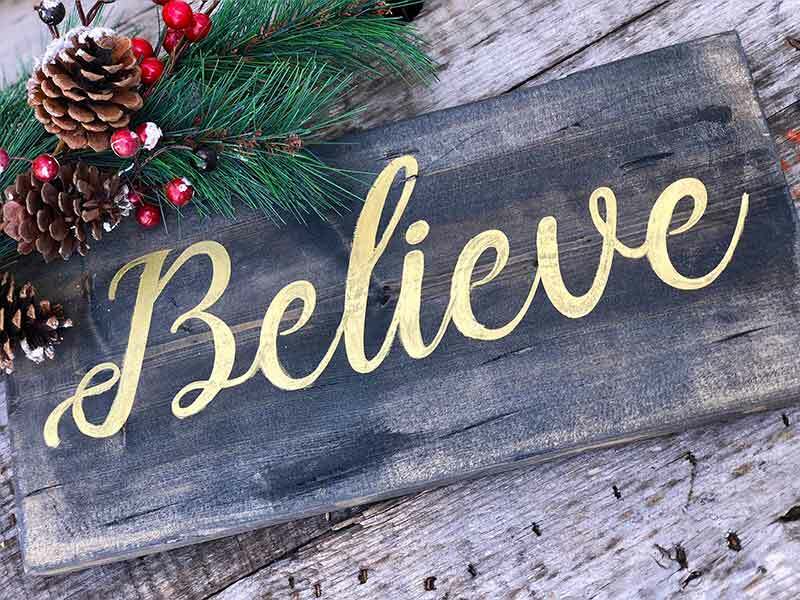 DIY wood signs are so trendy right now and they can make a big impact in any home’s décor. AR Workshop in Nashville and Franklin specializes in teaching customers to make stylish and custom décor pieces for their homes. At AR Workshop, supplies include large stencils, Sherwin Williams® paint, wood, laughter, and wine. But… you can also accomplish a similar project at home. 2. 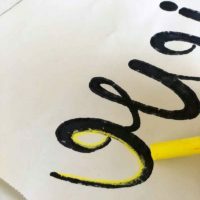 Print Out (or trace) of the word(s) you would like on the sign on a sheet of paper at the desired size to fit the piece of wood. 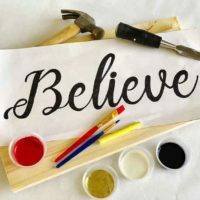 In this example, print out the word “Believe” in a size that will fit the piece of wood you have selected. 7. Drop cloth or other protective covering for your work surface. 1. Select the piece of wood you would like for the project. 2. Stain or paint the wood the desired background color (in our example we’ve chosen a stain that will make the wood look old and weathered). Allow the stain or paint to dry. 3. Print (or trace)—or if you’re an amazing artist, write—the word(s) you want to use on paper to fit the piece of wood. 4. On the back of the sheet of paper trace the outline of the letters with chalk. You’ll need enough chalk on the paper that it can transfer to the wood. 5. Place the paper, chalk side down, on the piece of wood. 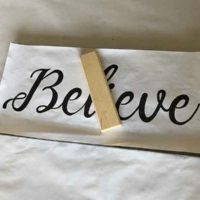 Position the word as you wish to have it appear on the wood. 6. Press heavily on the paper to transfer the chalk outline on to the wood, leaving an impression of the letters. 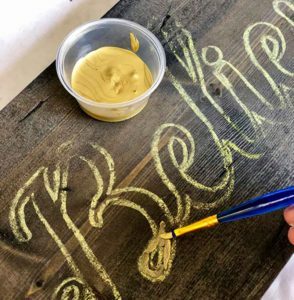 Hold the paper in place with one hand and lift up a corner to make sure you have enough chalk transferred to the wood to see when you remove the paper. 7. Using a brush or two and craft paint, fill in between the chalk lines. 8. If you have any visible chalk after painting, allow the paint to dry and wipe away the chalk. For more elaborate customize workshops please visit www.arworkshop.com/nashville. 1. Select a piece of wood that is smooth. If your wood has knots, cracks, etc., your paint job will not look as good. Whatever look you want is fine, just be sure what you want before you start your project. Lumber comes in a variety of grades, so check them out for the quality you want to use. 2. You can use decorative sprays of flowers, seasonal picks, and other pieces to add to your finished sign. 3. To hang your DIY sign, you can purchase picture-hanging hardware at a hardware store or framing supply shop. Be sure to consider the weight of your project when selecting hardware and wire or string/rope if you select that method of displaying your work.